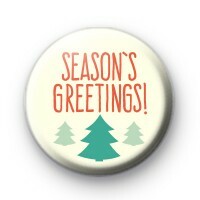 Get in the Christmas Spirit with our Festive button badges. This Christmas Tree Themed Badge has a very Scandinavian feel to it. It has the text Seasons Greetings & 3 green Christmas Trees underneath. A fantastic little badge for the Holidays & would look cute pinned to your Christmas Jumper or as a fun Stocking Filler. We have a huge selection of Xmas badges so be sure to take a look at them. All our badges are handmade (with love).